Thailand travel guide to weather, top beaches, price levels, and much more. * International arrival numbers are from 2014. The “Most popular among” category represents annual arrivals to Thailand by country divided by that country’s total population. As such we get an understanding of where Thailand is most popular per capita. Only countries falling within the top 25 total arrivals are considered here, and we have omitted the neighbouring countries of Laos, Cambodia, and Malaysia. 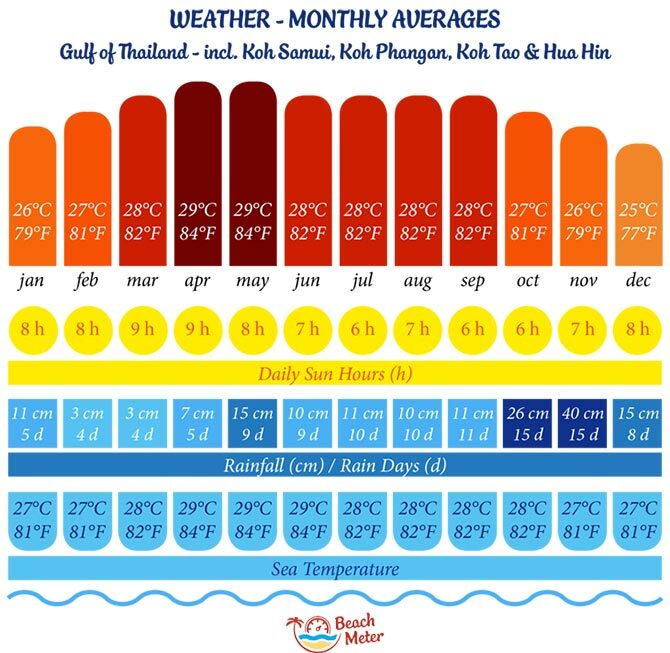 Thailand Weather – When to Go? Thailand can be visited at any time during the year. Even in the low season – or green as they prefer to call it in Thailand – there are good chances to get plenty of sunshine og relaxing days at the beach. 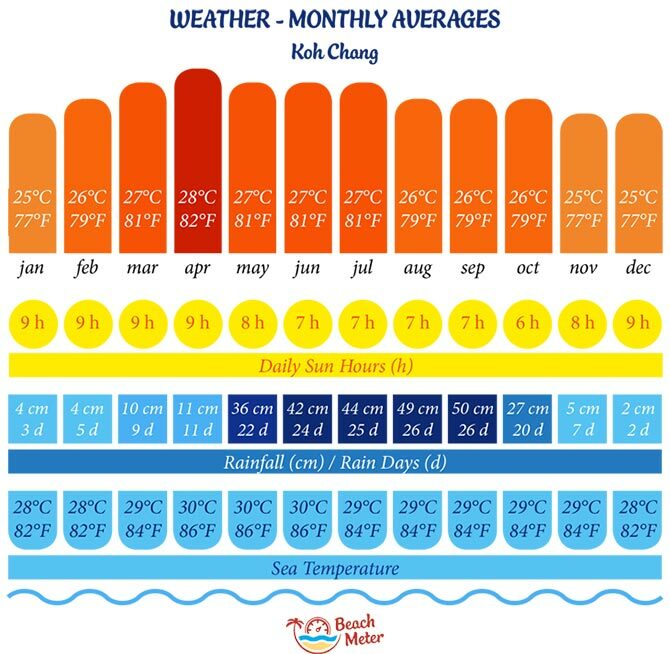 Weather seasons depend on where you are in Thailand, so remember to check the weather at your chosen destination. Snorkeling, diving, and surfing conditions depend a lot on the season, and don’t forget that the smaller islands in the Andaman Sea in southwest Thailand tend to fully close down their tourism infrastructure during the monsoons. The temperature will almost always be warm on any day of the year. In general, temperature highs are somewhere between 26-32°C (80-95°F), so you will rarely be freezing (unless you spend you days in the overly cold air-conditioned spaces). Humidity will always be high, but highest during the rainy season from July to October. The water temperature in Thailand is constantly reaching for 30°C (86°F) and will be pleasant to swim in anytime. 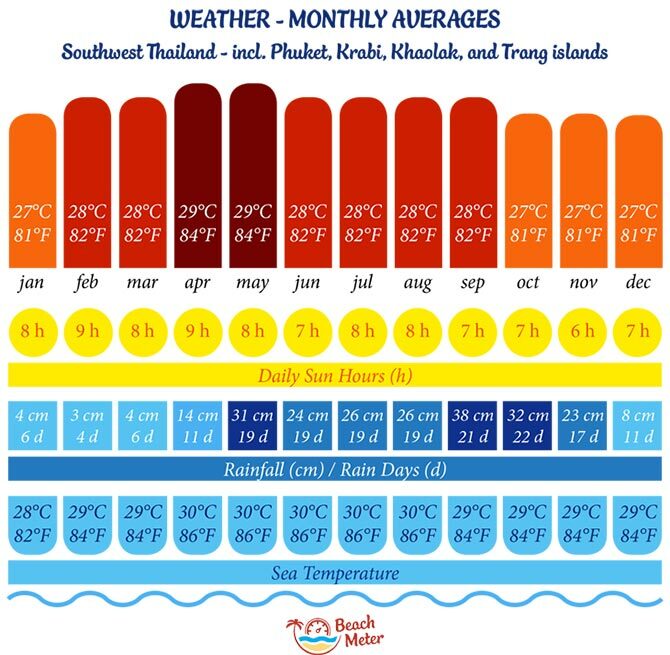 These three weather charts will give you a quick overview of the weather conditions of three main areas for beach holidays in Thailand; Southwest Thailand (Andaman Sea islands and beaches), The Gulf of Thailand, and the Koh Chang Area. Please note that the monthly temperatures shown are 24-hour average temperatures for the months in question. You can thus expect the average high and low temperatures to be around 4-5 degrees Celsius higher and lower, respectively. Thailand has been a major tourism destination for several centuries. This means that the tourism infrastructure is there, and it is well organized. The transportation network is comprehensive and arrival and departure schedules of flights, overland transfers, and ferries are generally matched so that travelers can easily get from A to B without too much hassle and lay-over time. Thai people are used to tourists and their quirky ways, the standard of certified guides is good, tour coaches and minivans are in excellent conditions (just remember your pull-over for those cold air-con systems), and the English language skills are acceptable albeit not on par with Malaysia, Philippines, and Singapore for example. There are amazing experiences awaiting in Thailand whether you are looking for natural wonders, culture, history, adventure or relaxation. If you are looking for beaches in Thailand, you have come to the right place. Thailand used to be full of Robinson Crusoe beaches with no tourists in sight. Of course that has changed a lot, so today Thailand offers the entire spectrum from secluded beaches (yes, they are still there) to mass tourism inferno beaches with rows upon rows of hotels, bars, malls, menus in your very own language, neon lights, and noise all around you. That is why, there is a beach for everyone. But you need to make sure you end up at the right beach for your holiday, because you may end up in Familyland, Sleazyland, or Backtobasicsland, when all you wanted was one of the other Beachlands in Thailand. No matter which beach atmosphere you are looking for, everyone agrees that the quality of beaches and the natural beauty of the thousands of Thai islands are among the world’s best. Thai cuisine does not need an introduction, but let’s just say that Thai people love food and it shows in their cooking. Meals are not just about filling your stomach – it is a highly valued social activity. Rarely will you see a Thai person eating alone, and in the few instances it does happen, you can be sure that they are uncomfortable and hurrying through their meal with eyes fixed downwards as if in shame. The best thing about Thai food culture is that food is shared. You do not buy a dish for yourself. Instead you order a number of dishes, place them in the middle of the table, and share the delights. This way you have a wider selection of food at each meal and the social bonds are strengthened by sharing. So if you are going to dinner with Thai friends, don’t expect to have your dish to yourself! In touristy areas the spicyness will often be toned down for the tourist tongues. Likewise the restaurant options will feature all international cuisines, so if you insist on Italian or Korean, you can find it. All major tourism destinations in Thailand have accommodation options that cover everything from the simplest bungalow or family-run guesthouse to the top international brand hotels. The further away from the main tourist areas you get, the fewer the options will be – not surprisingly. Hotel standards are high, meaning that a tourist class hotel (often considered a 3-star hotel by the industry) will be equivalent to a 3+ or 4-star hotel in many other countries. High service standards in an integral part of Thai culture, so also the hotel industry benefits from this. This page is under construction, so don’t forget to check back on our Thailand section. Great info about Thailand and I will sure share it. This is pretty accurate since I’ve been there several times. That’s wonderful to hear, Marc. Thank you for sharing. Thailand is awesome ! They know how to adapt their culture (for the majority) and the “modernization”, this is something we don’t have in Europe i feel. Anyway, nice post ! Thanks for all informations ! We will update this list with corresponding page links little by little. Don’t forget to check out our Bangkok Area Guide too!